Absinthe,” is the critically acclaimed acro-cabaret variety show that has been hailed by Las Vegas Sun as the most inventive and daring show to open on the Strip in years!" Named the "Best New Show" on the Strip by both Vegas SEVEN and Las Vegas Weekly. Absinthe at Caesars Palace is the fantastical blend of carnival and spectacle, featuring wild and outlandish acts in a theatre-in-the-round presentation suitable for all seasons. Audiences are treated to a night of imagination and excess with performances that amaze and inspire. 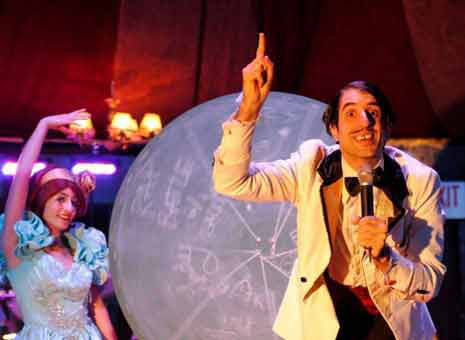 The cast of eccentrics evoke thrills and chills as they perform amazing feats of virtuosity, strength, balance and danger within mere feet of the audience surrounding the intimate state. Hosted by the foul-mouthed Gazillionaire, along with his raucous assistant, Penny Pibbets. Absinthe delivers jaw-dropping acts, raunchy comedy fun mixed with old world burlesque audiences have come to know and love. The New York Times hails “You’re close enough to see the sweat and grimaces needed to produce graceful, gravity defying stunts,” and sums up the entire “Absinthe” experience as, “Imagine Cirque du Soleil as channeled through ‘Rocky Horror Picture Show. Absinthe has been hailed as “the most inventive and daring show to open on the strip in years!” (Las Vegas Sun) Absinthe features outrageous comedy and a cast of wild and outlandish acts performing amazing feats of virtuosity within mere feet of the audience. As the Huffington Post declares, “It happens five feet away from you, and it’s awesome!